BIC (Book Industry Communication) today officially launched the Library Communication Framework (LCF). BIC is an independent UK organization that is "all about the book supply chain - both physical and digital, in retail and in libraries." Why should we care about something that BIC launches? We should care because we all share many ILS and RFID vendors including 3M, Bibliotheca, D-Tech, Innovative and SirsiDynix. And all of these vendors (and more) have signed on, and we want to support them for doing so while making sure they follow through with that commitment. NXP Semiconductors just announced a new chip, the ICODE SLIX 2, that they'll be incorporating in the RFID tags we use in libraries. RFID tags are composed of an antenna and a chip and adhesive backing. So this isn't a whole new tag but it will end up in a new tag eventually. Since the late 1980’s, libraries have been slowly adopting RFID (radio frequency identification) technology as a supplement to barcodes for library material identification and also as a way to replace legacy EM (electro-magnetic) security technologies (e.g. security strips). RFID provides a single system for efficiently checking in, checking out, and securing library material and because it is based on radiowave technology, it does not require line-of-sight. Unlike barcodes, which must be scanned one a time, multiple RFID-tagged items can be set on an RFID pad and checked in or checked out. RFID helps staff work faster and more ergonomically than one-at-a-time barcode systems. RFID is also easier for patrons to use at the self-check-out machines. Not only can staff and patrons check-out multiple items at a time, patrons are also less likely to be confused by the self-check-out process (e.g. distinguishing between barcodes and ISBN tags). Although there are several benefits to using RFID, adoption has been slow because of the cost of implementing RFID systems and also because the technology was lacking key standards that made investing in RFID somewhat risky – until fairly recently. 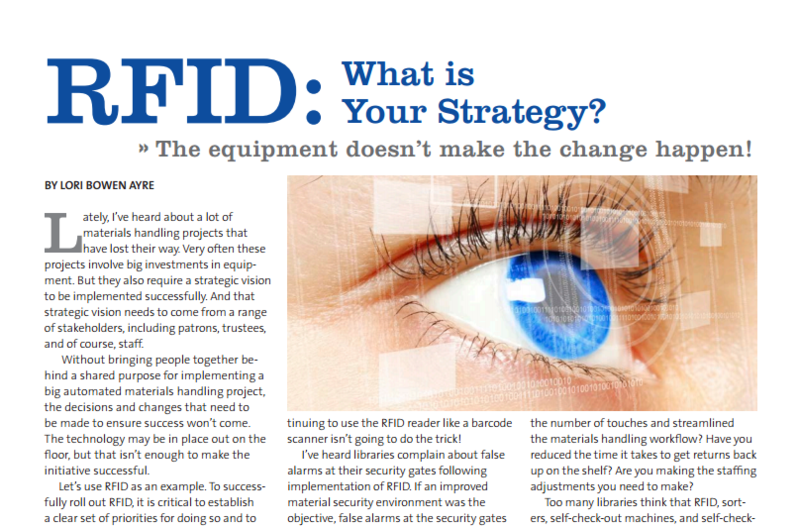 RFID: What is Your Strategy? To successfully roll out RFID, it is critical to establish a clear set of priorities for doing so and to continually make choices based on those priorities. Decisions must be made about how the system will be configured to suit the workflow you want to use. Remodeling may be required to locate equipment where it will be most effective. Signage and patron assistance will be required. Oftentimes, circulation policies need to be modified or materials security strategies need to change. I just came back from the California Library Association Annual Conference (which was a big hit, by the way!). As usual, I made my way through the exhibits talking with the vendors about ongoing projects and how things are going. This time, I came away a bit frustrated because it seemed like so many AMH and RFID projects appeared to be going a bit awry. The thing is, projects can go wrong very quickly when libraries pursue complex technology implementations without retaining the connection to the "why" of the project. In order to successfully roll out a capital-intensive technology project, it is critical to establish a clear objective, or set of priorities, for doing so. And to continually make choices based on those priorities. Another issue of Collaborative Librarianship is out and my Technology Matters column is about radio wave technologies and where the biggest privacy concerns really are. Some people refer to RFID chips as "tiny trackers" and that certainly makes them sound creepy. But it could be that the creepiest "tracker" out there is our beloved smartphone! It is easy to jump onto the Big Brother bandwagon and wrap everything in tin foil but the fact is that a lot of these technologies improve our lives, even save lives. Also, more and more people appreciate the convenience provided by these various technologies more than they worry about the implications for privacy. It is important, therefore, for librarians to help our patrons become educated consumers so they can make choices that strike the right balance of privacy and convenience for themselves. Coming to Milwaukee area June 26th "RFID: What is it? Where is it going? Is it right for your library?" I'll be at the New Berlin Public Library June 26th to talk about RFID. AFter the morning session, described below, we'll have a few hours in the afternoon for open discussion. Members of the Waukesha County Federated Library System, Eastern Shores Library System, Kenosha County Library System, Lakeshores Library System, Mid-Wisconsin Federated Library System, Milwaukee County Federated Library System, and also UW-Milwaukee SOIS are invited! When Will an ILS Vendor Provide an RFID-Enabled Staff Client? Once your library decides to transition to RFID, one of the first things you have to consider if integration with library management system (LMS aka ILS) and your RFID system. Basic check-out on your self-check machines will probably work just dandy regardless of your RFID/LMS vendors because these communications are usually based on SIP2. But as soon as you get into any advanced functionality (e.g. fee payment, account management) on the self-checks and especially when you get into the functionality of the staff client, it all goes to hell. Once your library decides to transition to RFID, one of the first things you have to consider is integration with library management system (LMS aka ILS) and your RFID system. Basic check-out on your self-check machines will probably work just dandy regardless of your RFID/LMS vendors because these communications are usually based on SIP2. But as soon as you get into any advanced functionality (e.g. fee payment, account management) on the self-checks and especially when you get into the functionality of the staff client, it all goes to hell.